Arduino platform seems to interest many Internet of Things developers. There are now many Arduino compatible platforms with wireless connectivity as you can see in my New interesting Arduino platforms article and it’s comment. Also Google has done some Arduino based IoT. Arduino launches Yún for WiFi connectivity under Linux article tells that Arduino has been revamped to offer WiFi connectivity under Linux, in order to make connecting to complex web services much easier directly from the device. The new board (not yet available to buy) is named the Arduino Yún, which apparently is Chinese for “cloud”. It was announced in annual “State of Arduino” presentation at the Maker Faire conference in California on Saturday. 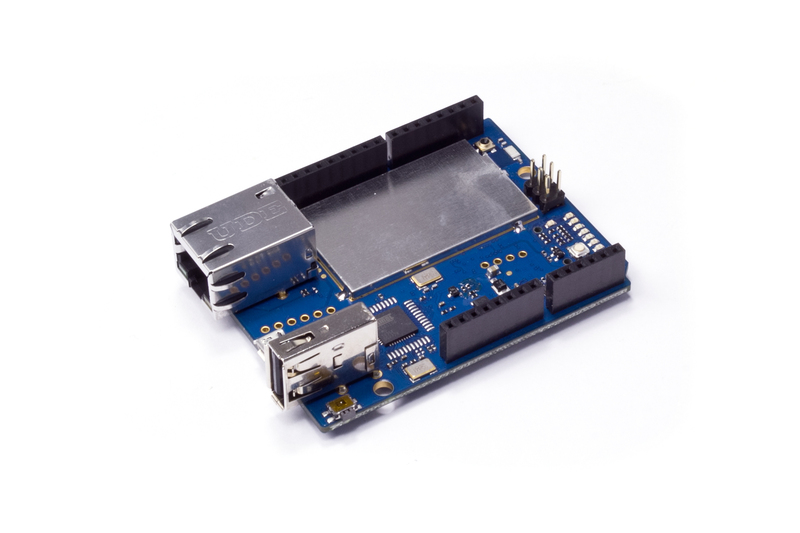 Arduino Yún is the combination of a classic Arduino Leonardo (based on the Atmega32U4 processor) with a Wifi system-on-a-chip running Linino (a MIPS GNU/Linux based on OpenWRT). WiFi system on chip Atheros AR9331 on the board runs customised version of the Linux operating system (OS) distribution OpenWRT called Linino. “Historically, interfacing Arduino with complex web services has been quite a challenge due to the limited memory available and they tend to use verbose text based formats like XML that require quite a lot of RAM to parse,” Arduino’s blog post read. On the Arduino Yún all network connections and processing of HTTP transactions is done in the Linux machine in WiFi SoC, so it does not cause burden to Arduino hardware. Using the Bridge library in your sketches, you can link the 32u4 to Linux. 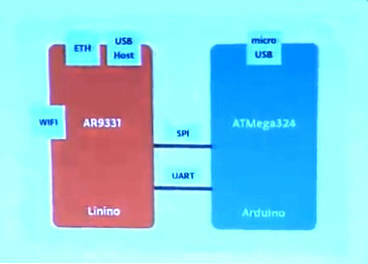 Arduino Yún Brings WiFi has the following picture that seems to indicate that Linux and Atmel 32u4 are linked together with SPI and UART pins. The Yún Linux part supports Shell and Python scripts out-of-the-box but you can install a wide range of open source software and tools. Yún can be also reached with SSH. Usually setting up WiFi connection on embedded systems is usually hard (especially if you want to connect to protected network). Arduino Yún board claims to have easy way to set up the device network connection: When the Yún is turned on for the first time, it becomes an Access Point, creating a Wi-Fi network named “Arduino”. Open your browser and go to the webpanel: configure the board by entering your Wi-Fi network name, type and password. Click the “Configure” button to restart the board and have it join your home network. The Yún ATMega32u4 can be programmed as a standard Arduino board by plugging it to your computer with the micro USB connector. And you can also program it via Wi-Fi (Arduino IDE has option to set IP address instead of port name). Arduino Yún developers have partnered with startup Temboo which provides normalized access to 100+ APIs from a single point of contact allowing developers to mix and match data coming from multiple platforms (for example Twitter, Facebook, Foursquare but even FedEx or PayPal). This looks interesting. The first question that come to mind ofter the feature is when this will become available and what does this cost? Arduino blog tells that Arduino Yún will be available at the end of June at the price of 69$ + taxes. Plus on this: Finally a board that handles everything without the need for shields, breakouts, dongles and other boards! I like both worlds… Arduino and Embedded Linux boxes. Looks somewhat interesting, but keep in mind that RPi is still only half the price of the Yun and you can add WiFi to it with very cheap USB adapters. You can get a raspberry + an arduino for the same price … and they work together very well. There is also other competition on the field. Just few days earlier another company called Spark Devices launched a similar idea on Kickstarter called Spark Core. That initiative puts forward a Wi-Fi capable board for Arduino projects that permits wireless programming and the ability to interface with Web services. The initial price for this Spark Core idea is $39. The hardware designs for the Core are available to check out at the GitHub repository. There will clearly be competition on the cheap WiFi enabled Arduino like embedded platforms. SAN MATEO, Calif. – Massimo Banzi launched a $69 board that aims to plug do-it-yourself-ers into the cloud. The Yun is the first of a family of low cost, low power Arduino cards that run Linux and Wi-Fi, surfing the trend toward the Internet of Things. Yun, named for the Chinese word for cloud, aims to let the average tinkerer link a new Linux gadget to the Web using a simplified browser interface. “We want to make it easy for people to create complex Web apps,” Banzi told a packed crowd at the center stage of the Maker Faire event here. Yun links to the Web via the Hornet AR9331 Wi-Fi chip from Qualcomm Atheros which supports 2.4 GHz networking and runs a custom distribution of Linux, said Federico Musto who had the idea for the board and did the initial design work. Musto shared his idea with Banzi when the two met by accident on a train in December. Musto showed a Qualcomm Atheros representative at the Consumer Electronics Show in January an early version of the board based on a reverse engineered smartphone module using the AR9331. A technical director of the company subsequently gave approval to supply the chip for the open source boards. There’s also support for Temboo, an SDK for dozens of APIs that interact with Facebook, Dropbox, FedEx, and hundreds of other web services. As with any non-standard Arduino board, the WildFire does require some modification to the Arduino IDE. This took a bit of time with the pre-release board. Wicked Device has streamlined the process since then. Once the IDE is up and running, its easy to get the WildFire’s CC3000 connected to your local access point. From there the internet is your playground. The Arduino Yún was the first of a new breed of Arduinos that added a big honkin’ Linux System on Chip to the familiar ATMega microcontroller and unique pin headers. It’s a surprisingly powerful system, but also very simple: basically, it’s just an Atheros AR9331 running Linux, an ATMega32u4 doing its Arduino thing, both connected by a serial connection. The Atheros AR9931 is also found in a router popular amongst hardware hackers. It really was only a matter of time before someone ported the Yun software to a router, then. So it looks like Arduino’s hands are tied. Is this a change of strategy for the Arduino folks or did they just make a mistake? I think the Yún is the project of the Martino-led Arduino company now being sued by the Banzi-headed Arduino company. The latter one pushes for the open source idea while the former does not. Actually Banzi has griped about Arduino clones that don’t pay money to him. Yet many $3 clones are custom designs that use cheaper serial chips than the ch340 and sometimes have a beefier 3.3v regulator than the $30 uno. The crux of the hack is getting the AVR to run out of RAM, which more than a few of us have done accidentally from time to time. Here, the hackers write more and more data into memory until they end up writing into the heap, where data that’s used to control the program lives. Writing a worm for the AVR isn’t as easy as it was in the 1990’s on PCs, because a lot of the code that you’d like to run is in flash, and thus immutable.